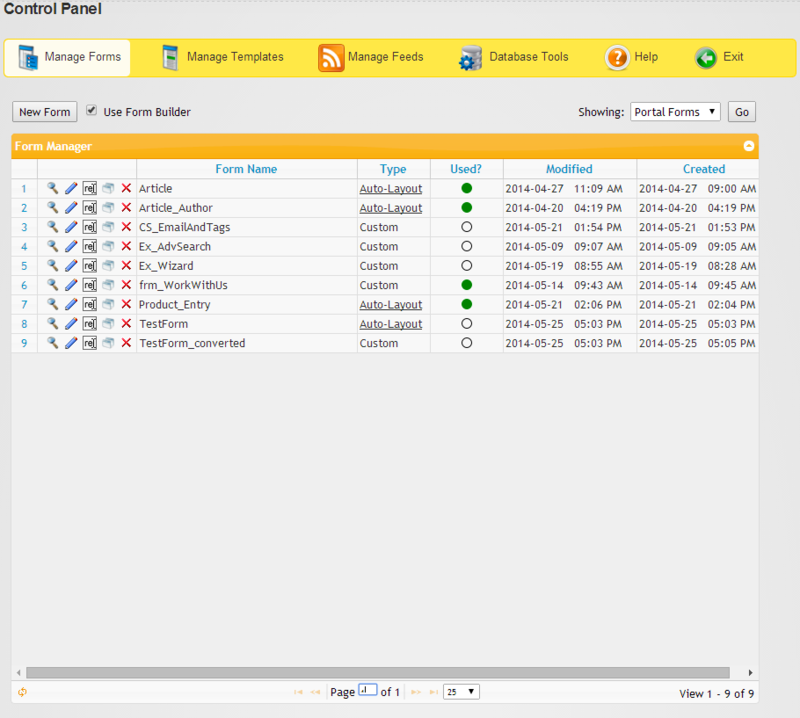 Not simply a Form Builder, XMod Pro is the only complete application builder for DNN. and is compatible with Windows SQL Azure Database. 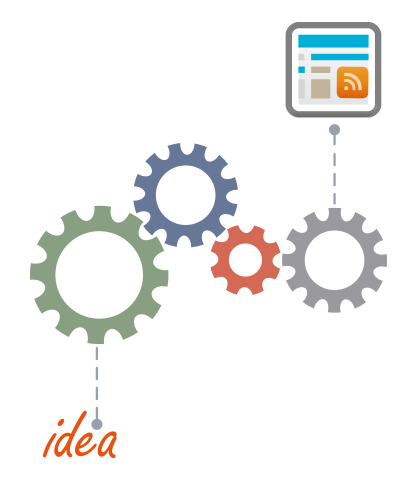 Go From Idea to Completion in Record Time! XMod Pro is the only module that enables you to build a complete application in as little as a few minutes, complete with the ability to add, edit, delete and display your data - all in one module. Add your own HTML and CSS to make it yours. No need to purchase a "forms" module and a "grid" module. 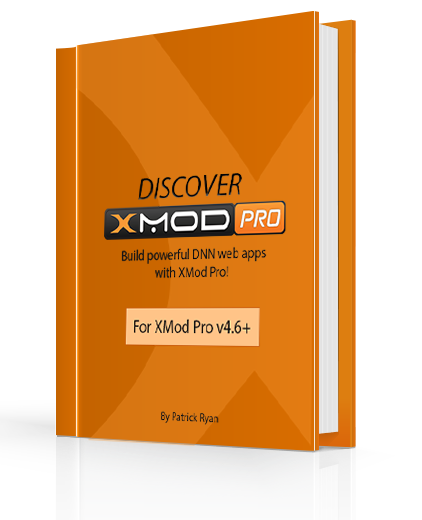 Backed by a company with over 10 years of history building and supporting DNN modules, XMod Pro is simply the best value of any option available. 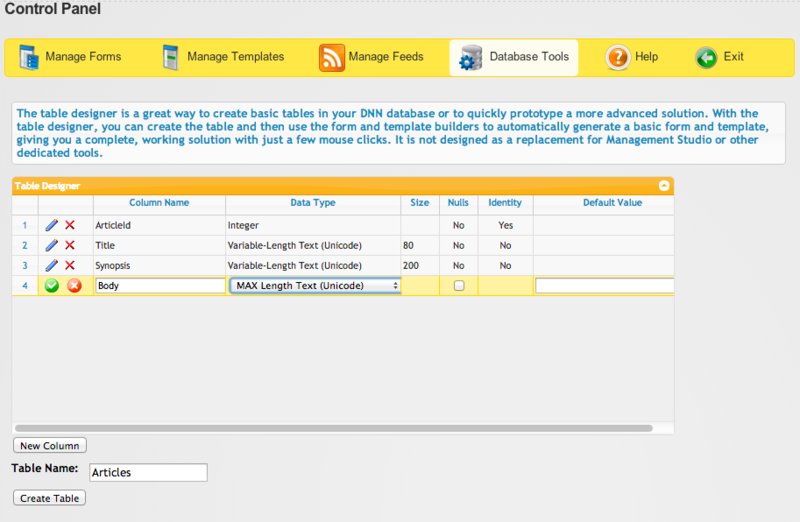 XMod Pro allowed us to quickly build custom functionality for the dnnsoftware.com launch. Because of its speed and versatility, it is one of the very few third party modules that we allow on the site. Joe Brinkman, Co-Founder and Technical Fellow, DNN Corp.
XMod Pro is a complete application builder for DNN. Our tools make it simple to build a fully functional custom module within minutes and then customize it to fit the look and feel of your site. XMod Pro is Localizable Too! Easily create apps from your database with a couple of clicks. You get Add/Edit/Delete and list/detail views in mere minutes. You can control the HTML and CSS so any layout or integration with responsive frameworks like Bootstrap is easy. Our tools will build your SQL commands but you can also use your own tables, views, stored procedures, and functions in the DNN database or in external SQL Server databases. Don't like the interface of one of your modules? Do you want to enhance its feature set? 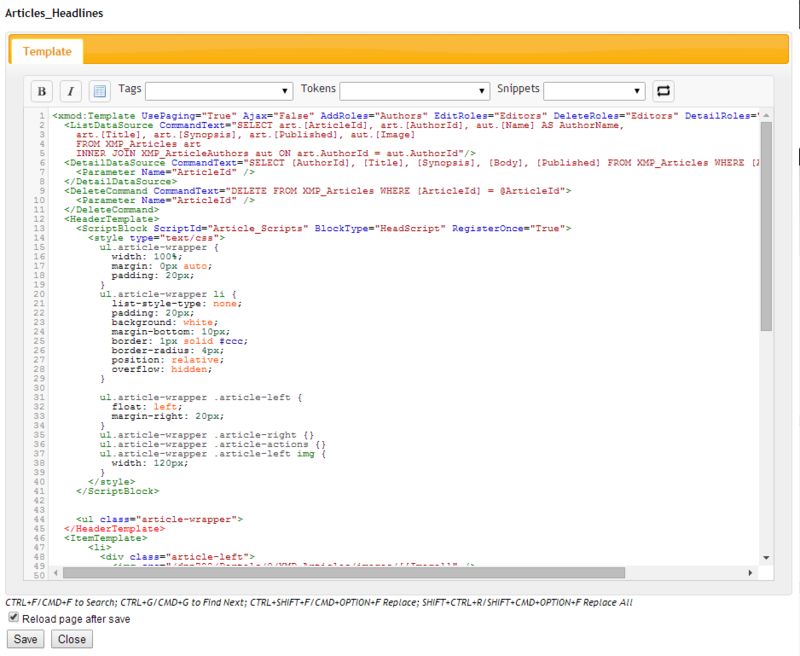 Use XMod Pro's power to tie into its tables and stored procedures to write your own. Feeds enable you to provide not only data feeds like RSS, but also create printer-friendly HTML pages, downloadable CSV, Word, and Excel files, and output JSON data to use your pages. Since 2004, we've been selling XMod, and now XMod Pro to rave reviews. Thousands of sites and customers trust XMod Pro to deliver for them. It's easy to get started with XMod Pro but it is the deepest module out there because we provide a lot of functionality. We offer articles and how-to's, free Module Kits as jump-starts, as well as a vibrant community providing answers to your pressing questions. 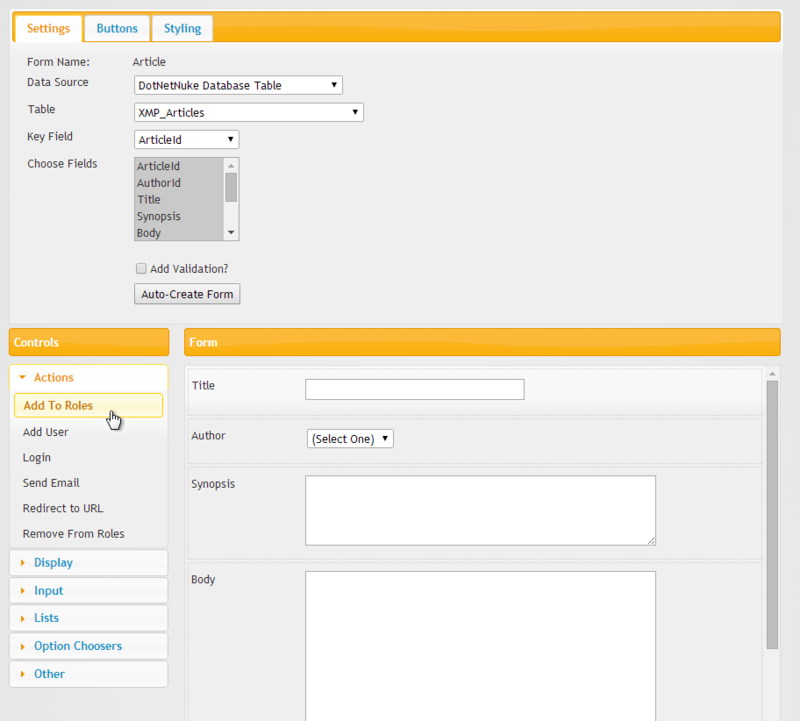 Form Builder: Generate forms for DotNetNuke in a snap! Build your form with ease of drag & drop and style it in minutes with the integrated design/style of jQuery UI.This form generator gives you complete control to create custom DNN forms for any use quickly and easily. Custom Registration and Role Management: Create custom Registration and Login forms for your DNN site. You can even add and remove roles for users in your forms too. Send Emails: Define one or more email templates, each of which can be sent to different email addresses. So you can send a confirmation to the customer and a different email to the sales department. Success Messages and Redirection: Thank your user for their submission, provide additional links and more. Send users to different URLs and/or silently POST information to yet another URL. Localization: All Form information is fully localizable. Labels and data can be localized. You can even have distinct forms and different data commands for each language and XMod Pro will dynamically the form based on the current language. This allows you to present a different layout or different set of form fields and data commands based on the user's current locale. Extensible: Create custom form controls and actions (commands that execute without a user interface) or purchase pre-made controls and actions from our growing list of 3rd party add-on developers. Multiple Views in One Module Instance: Original to XMod Pro, this innovative feature allows you to craft a more complete application experience. 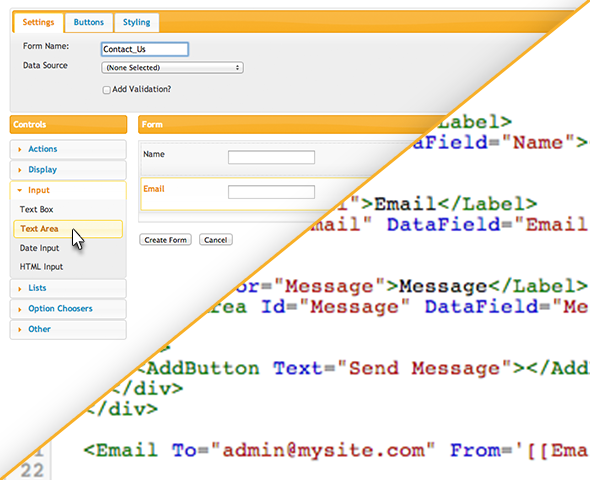 You can mix and match multiple views in one module instance and lay them out with HTML. Even better, clicking a button in one view can trigger updates to one or more other views. If you have AJAX enabled, it all happens without a page refresh. Feeds - the Unsung Hero of XMod Pro: Create RSS feeds, XML exports, Excel and CSV downloads, printer-friendly pages. 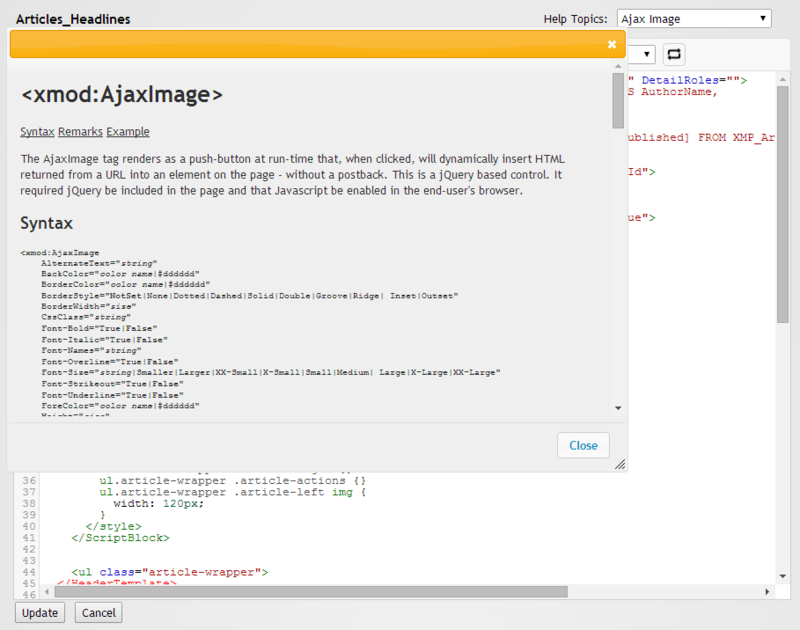 Also, use feeds to easily drive your AJAX interface - retrieve HTML or JSON data and even execute data commands. You can even secure your feeds by DNN role. There very few things you cannot do with Feeds. Searching, Sorting, Paging Built-In: Provide XMod Pro with a little information about your data and it will setup a search box and sort box for your data. Paging is automatic. All of these features are customizable. 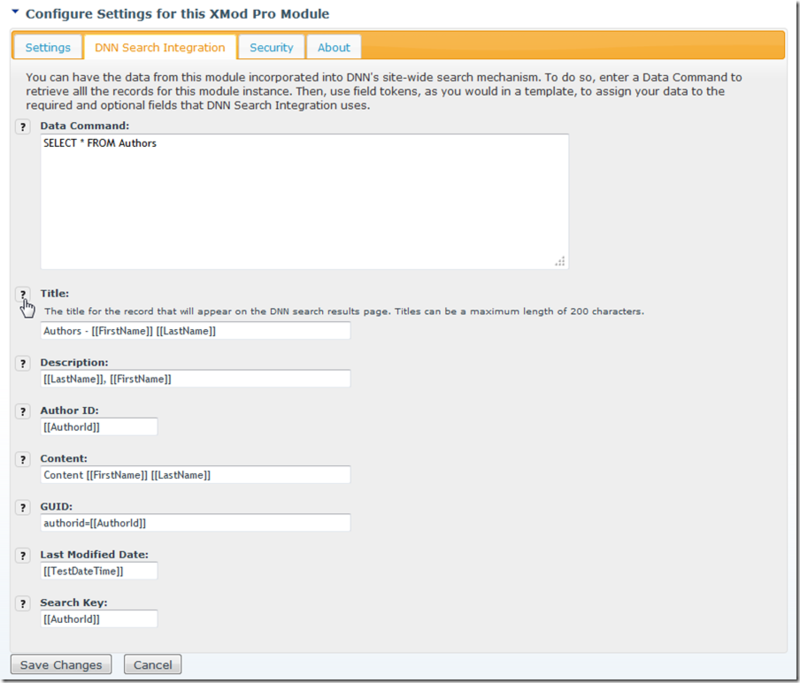 Advanced searching is possible by passing values into the page via the URL or POST so you can create a custom search form using XMod Pro and use that to perform an advanced search. Enhance SEO Capabilities and Facebook Integration: XMod Pro gives you the ability to dynamically add-to or change the page's Title, Keywords, and Description. 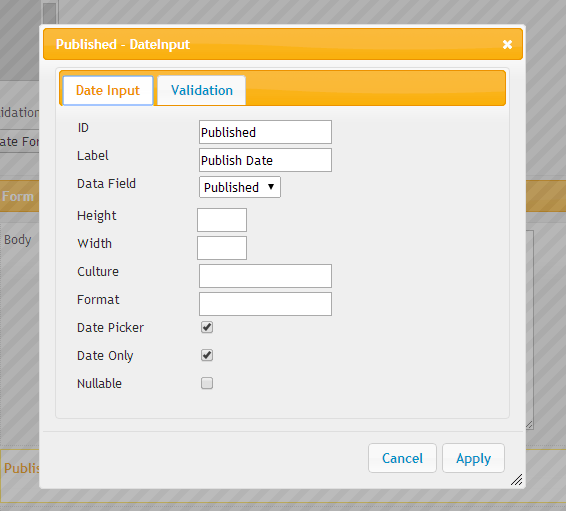 Use hard-coded values, environmental data, or data from the database. You can even create custom meta tags so you can now customize your pages with Facebook's Open Graph. Localization: You can detect and react to the current locale to retrieve localized content. XMod Pro can dynamically load a different view based on the current locale. Plus, XMod Pro's Format tag enables you to format dates and currency according to the current locale. Custom Data Commands: In addition to standard CRUD commands, you can add custom commands. For instance, with these commands you could setup a button to approve a record or do anything else you need in the database. DNN Search Integration: Using a custom query, combined with field tokens and your text, you can make sure t he DNN search engine indexes and returns exactly the information you want. Share Forms and Templates Across Portals: Global forms and templates can be used on all of your site's portals. This greatly simplifies maintenance for multi-portal sites since you only have to make changes in one place and those changes will automatically propagate to all your portals. 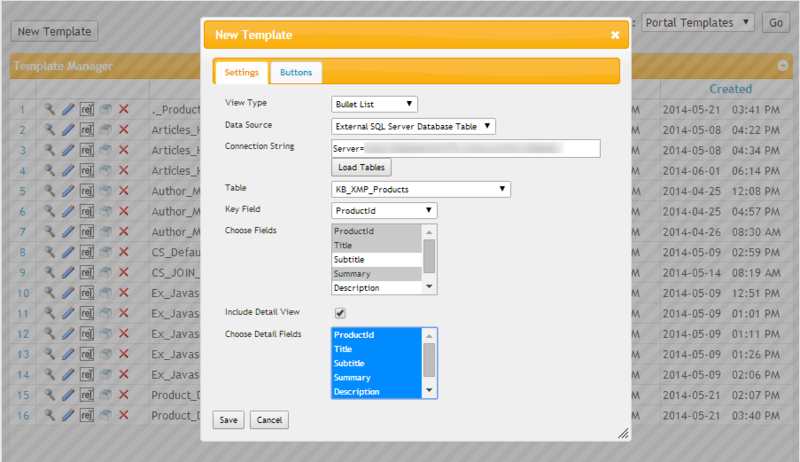 Integrated Database Table Designer: Now there's no need to fire up SQL Server Management Studio to whip up a quick prototype database table. You can create basic tables from within XMod Pro. Use the built-in table creator to create columns, name them, select a data type, allow Null values, mark the column as an identity field, and set default data values. Free Staging/Localhost License: Each license entitles you to run XMod Pro on your "localhost" environment for development purposes without requiring licensing. Free Upgrades for 1 Year: Every license comes with a complimentary one-year subscription that covers free module upgrades for one year. This means that, from the date of purchase, you will receive all XMod Pro updates including minor and major versions for one year at no extra charge. Use Them. Take Them Apart. Copy and Learn from Them. These module kits are designed to give you a quick start on your next project and for you to peek under the hood to see how things are done. We want you to get in and modify them. Please note that our XMod Pro Module Kits are designed for and, thus, require XMod Pro in order to run. Easy to Use Solutions, Snippets, and How-To's. The XMod Pro Community has come together to provide this excellent Exchange to help you build solutions with XMod Pro even more quickly than ever before. Please note that all XMod Pro Exchange solutions are designed for and, thus, require XMod Pro in order to run. 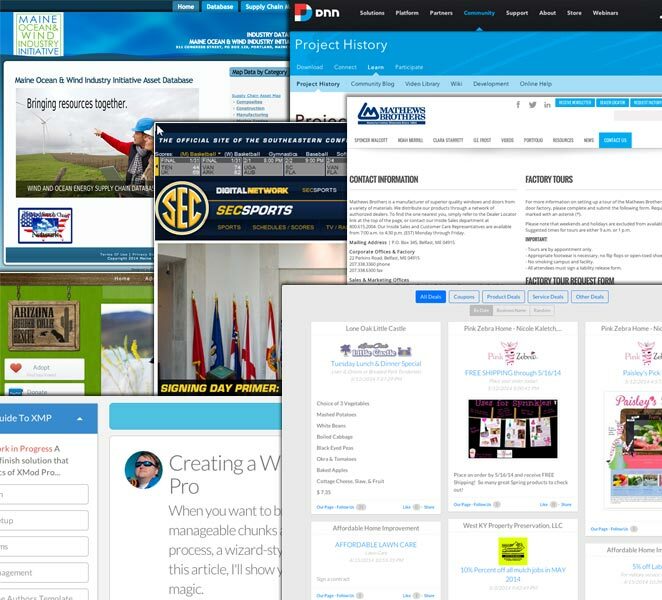 From drag-n-drop builders to wizards to code editing to forms, templates, and feed management, you'll find all you need to build solutions in DNN quickly and customize as needed. We're sure there's probably something that can't be built with XMod Pro but we haven't found it yet. XMod Pro's popularity and expandability has spurred a growing market of add-ons - from AJAX file upload controls to Twitter and RSS views to integration with web services like MailChimp and Clickatell. This is just a sampling of what's available. Master XMod Pro Fast. Read the Book. "Discover XMod Pro" has been written for and about XMod Pro by community member and certified XMod Pro trainer Patrick Ryan. This Online Book teaches users of XMod Pro, how to build a web application from scratch by leveraging the combined power of XMod Pro and DNN. Whether you're a web developer, graphic designer or even a database administrator, having the confidence to develop applications efficiently is a priceless reward. Patrick will teach you how to build custom module solutions with DNN and XMod Pro by walking you through a complete application from start to finish! Let's face it. No module you ever buy will do exactly what you want. Some modules you want probably aren't even offered. Those that are, may be sold by vendors that go out of business, leaving you stranded with a broken module or site that can't be upgraded. DNNDev has been building XMod and now XMod Pro for over 10 years. While other vendors have come and gone, we'vecontinued developing and supporting our products. Each license purchased entitles you to use XMod Pro on 'localhost' for development purposes as well as on a single production (internal or public-facing) DNN install (defined as a single DNN database). Within that single DNN install, you may use XMod Pro on as many portals as you'd like. YOU SHOULD CAREFULLY READ THE FOLLOWING TERMS AND CONDITIONS BEFORE PURCHASING THE LICENSE TO USE THIS SOFTWARE. BY PURCHASING THE LICENSE TO USE THIS SOFTWARE YOU ACCEPT THESE TERMS AND CONDITIONS AND UNDERSTAND THAT THEY WILL BE LEGALLY BINDING ON YOU, ANY END USER, AND THE COMPANY. IF YOU DO NOT AGREE WITH THEM, OR DO NOT WANT THEM TO BE BINDING ON YOU, YOU SHOULD NOT PURCHASE THE LICENSE TO USE THIS SOFTWARE. It is hereby understood and agreed that KnowBetter Creative Services LLC (“Licensor”) is the owner of all right title and interest to XMod Pro (“Software”) which you are about to purchase a license to use and download. You, as licensee (“Licensee”) through your purchase of this license to use the Software do not acquire any ownership rights to the Software. The Software which accompanies this license is the property of Licensor and is protected by copyright law. Licensor reserves the right to transfer it rights herein and ownership interest in the Software. In the event Licensor transfers its rights herein and ownership interest in the Software, such transfer shall not affect the rights and obligations of any party to this agreement and this agreement shall remain in full force affect. This is a license, not a transfer of title or ownership to the Software. In consideration of the payment of a license fee, Licensor hereby grants Licensee a nonexclusive license to use one copy of the Software on a single production website and an unlimited number of development websites. However, the websites the Software is used for, whether production or development, may only be used with a single DotNetNuke database. For the purposes of this agreement, “development websites” are defined as a website or websites used solely for configuring, testing, and developing applications with the Software prior to installation of the Software on a production website for a single DotNetNuke database. For the purposes of this agreement, a “production website” is defined as a website running a single DotNetNuke database, which may be either a public-facing web server or a private server running on an intranet. Under no circumstances may the Software be used on more than one DotNetNuke database without purchasing additional licenses. A. The license is effective until terminated. Licensee may terminate it at any time by destroying the Software together with all copies thereof. B. This license will terminate upon conditions set forth elsewhere within this Agreement or if Licensee fails to comply with any term or condition of this Agreement. In such event, no notice shall be required by Licensor to effect such termination. C. Upon termination of this agreement, Licensee agrees to destroy the Software together with all backup copies, modifications, printed or written materials, and merged portions in any form, or return same to Licensor at Licensee's expense. (1) Copy or reproduce the Software in any way. (2) Use the Software on more than one DotNetNuke database without purchasing additional licenses. (3) Transfer, distribute, modify or translate the Software, or any portion thereof. (4) Disassemble, decompile, or otherwise reverse engineer the Software or any of its data in any way, shape, or form. (5) Distribute License Codes, in whole or in part, for this product to any other party. This license does not entitle Licensee to any upgrades. Licensor may, at its sole discretion, make certain free patches and service packs available to Licensees. This license, if purchased with a subscription, entitles the Licensee to certain free upgrades, patches, and service packs made available by the Licensor during the subscription period. Any license to use any upgrades, supplements, add-on components, patches, and service packs to the Software subsequently provided by Licensor, whether purchased or not, are subject to the same terms and conditions as provided herein. Licensor reserves the right to supplement this agreement with additional terms along with any subsequent upgrades, supplements, add-on components, patches, and service packs to the Software. A. THE SOFTWARE IS PROVIDED "AS IS" WITHOUT WARRANTY OF ANY KIND, EITHER EXPRESS OR IMPLIED, INCLUDING, BUT NOT LIMITED TO, THE IMPLIED WARRANTIES OF MERCHANTABILITY AND FITNESS FOR A PARTICULAR PURPOSE. LICENSOR DOES NOT WARRANT THAT THE FUNCTIONS CONTAINED IN THE SOFTWARE WILL MEET YOUR REQUIREMENTS OR THAT THE OPERATION OF THE SOFTWARE WILL BE UNINTERRUPTED OR ERROR FREE. The entire risk as to the quality and performance of the Software is with you. Should the Software prove defective, you (and not the Licensor) assume the entire cost of all necessary servicing, repair, or correction. B. Licensee shall assume responsibility for the selection of the Software and for the installation, use, and results obtained from the Software. C. Some states do not allow the exclusion of implied warranties, so the above exclusion may not apply to you. This warranty gives you specific legal rights, and you may also have other rights that vary from state to state. D. By purchasing license to use and download the Software, you agree to accept all liability regarding its use or misuse. In no event will Licensor be liable for any damages, including but not limited to, lost profits, lost savings, or other incidental or consequential damages arising out of the use or inability to use such Software even if Licensor or its authorized dealer has been advised of the possibility of such damages, or for any claim by any other party. Some states do not allow the limitations or exclusion of liability for incidental or consequential damages, so the above limitation or exclusion may not apply to you. A. This Agreement and the Limited Warranty shall be governed by the laws of Arizona. B. All disputes hereunder shall be resolved in the applicable state or federal courts of Arizona. The parties consent to the jurisdiction of such courts, agree to accept service of process by mail, and waive any jurisdictional or venue defenses otherwise available. This Agreement constitutes the entire understanding of the parties, and revokes and supersedes all prior agreements, oral or written, between the parties, and is intended as a final expression of their Agreement. It shall not be modified or amended except in writing signed by the parties hereto and specifically referring to this Agreement. This Agreement shall take precedence over any other documents that may be in conflict therewith. IF any provision of this Agreement is held to be void, invalid, unenforceable or illegal, the other provisions shall continue in full force and effect. LICENSEE HEREBY ACKNOWLEDGES THAT IT HAS READ THIS AGREEMENT, UNDERSTANDS IT, AND BY PURCHASING THE LICENSE TO USE THIS SOFTWARE AGREES TO BE BOUND BY ITS TERMS AND CONDITIONS. POWERFUL module! I love the feature of connecting to external databases! Steep learning curve but that's because of what it can do! Works as advertised. easy to setup install and get started. This module has been a huge time saver! I've used a number of DNN data manipulation modules and found this one to be the most dynamic and polished. Excellent control and the support and knowledge base will jump start your app. A must have control for DNN. Excellent product. Learning curve is needed but very easy to manipulate once learned. I couldn't live without this module. It's one of my very shortlist of must-have's. A must have, very powerful, frequent improvement and great documentation and support. powerfull module kits and excellent support! Ease of use and complete guide makes the learning curve so easy! I love it! This "toolbox" is really incredible. By adding some jQuery you can built an entire web application. Very useful, well-documented. A must have. A great product for developing Reports & Forms. Very flexible. Great customer service. Great update to an outstanding module. The New Feed Option is just such a benefit, also for SEO. This is totally worth upgrading. More than we expect, is the best of the best, also support. Been using XMP for some time now. Always my go-to solution when I have to build a lot of data templates and forms for a DNN site. 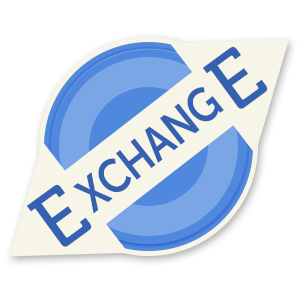 For using the administrative and design features of the module we recommend IE9, Firefox, Google Chrome, or Safari.